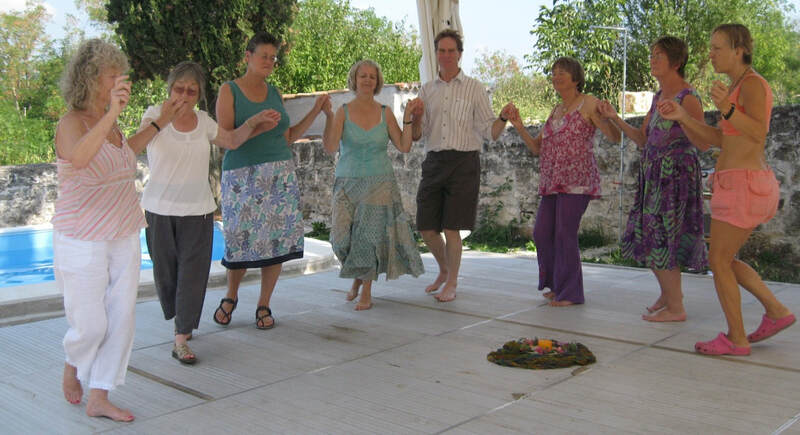 Nearly every Tuesday morning (10-12) from September to July many enjoy Circle Dancing . However your first question might well be “Well what’s that? Bit Like Line dancing?”. It is not! and the first thing I could say is “come and give it a try!” but I would then tell you that no future class will ever be as difficult as your first, as you have little idea if what to expect..
Let me try to give you a flavour of my style of Circle Dancing, as like many activities it can be very different with different teachers. There is a similarity with folk dancing. If you have ever been Scottish or folk dancing then you will be used to following detailed instructions for each step. Each dance is clearly choreographed. However in those dances you nearly always have to have a Partner, but Circle Dancing is ideal for all who want to come dancing, with or without one. The dances can be very expressive. We dance for joy and we can dance for sorrow, we dance for the cycle of the year, and for life events, and to support others. Many of the dances come from international folk dancing, from Greece, Israel, Russia and Romania for instance, where they are imbedded in community life. They are danced by men and women, old and young, so they are very inclusive. For example there is a midwife’s dance, and dances against tyranny. Most, as you would expect are danced in a circle, but that might be unjoined at times, or you might find yourself in a short line. We dance too to World Music – have you ever danced to an Eskimo band from Kamchatka? - and many lovely dances are set to classical music, one of the first was set to Pachelbel’s Canon. A single class costs £6, but there is always a reduction for those who pay up front for a term, making it £5 a class or even less. We enjoy a mid-time break for a drink and a nibble and a very small charge is made for that. This is a good chance to catch up with each other after the concentration of learning the dances. It is that concentration, of being in the moment, which makes Circle Dance so refreshing. I find the same with Tai Chi or in throwing a pot. What to wear? Footwear is the most important. You do not need a special shoe, but it must be enclosed, and flat, with a soft flexible sole. I see many Hotter shoes around the Circle. Check that the sole will let you swivel on wood. Trainers squeak, which can prove embarrassing! Unless it is a Special dance (And we do have those too from time to time) most people wear trousers or a loose skirt, and layers above that, which can be shed as you warm up.